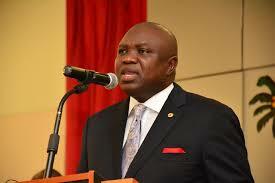 The Orabella's Blog...: Governor Ambode Bans VIO Permanently!!! Mr. Akinwunmi Ambode, Lagos State Government cleared the air concerning the absence of Vehicle Inspection Officers (VIO) on Lagos roads to stop all activities, stating emphatically that he has instructed them to stay off the roads permanently. Governor Ambode, who said this at the commissioning of Pedestrian Bridges, Laybys and Slip Road at Ojodu Berger, also stated categorically that the Federal Road Safety Corps (FRSC) should limit its operations and duties on highways. The decisions was made in line with his administration's resolve to have a traffic free movement across the state, stating that their activities were worsening the current situation of traffic congestion on Lagos Roads. “Distinguished ladies and gentlemen, let me use this opportunity to reiterate that Vehicle Inspection Officers (VIO) have been asked to stay off our roads permanently. We also advice the Federal Road Safety Corps to stay on the fringes and highways and not on the main streets of Lagos. It has become evident that these agencies contribute to the traffic challenges on our roads. What we set out to achieve with this project was to ensure smooth flow of traffic along the express, safeguard the lives of our people who had to run across the express and project the image of a truly global city to our visitors. Today, we are delighted that we have not only succeeded in transforming the landscape of this axis but with the slip road, lay bys and pedestrian bridge, we have given a new and pleasant experience to all entering and exiting our State. This project is the product of our innovative team of engineers, architects and town planners who have worked hard to create an innovative solution to tackle the challenges of this axis. I say a big thank you to the staff of the Lagos State Ministry of Works and the contractors – CCECC Nigeria Limited for a job well done. To improve on the project, food court would be built where people can relax before climbing the pedestrian bridge, as well as an interstate bus terminal within the Ojodu Berger axis for buses coming from outside Lagos to drop and load passengers, while intercity transportation system would move commuters within the city. Traffic interventions would not only stop at the Ojodu Berger axis, but would be an ongoing process to create solutions to traffic congestion in every part of the State. If your neighbourhood or community is experiencing traffic challenges, be rest assured that we will soon be there. We will always ensure that promises made are promises kept. We will continue to rely on the support of all segments of the population for regular tax payments, obeying the rule of law and protection of public infrastructure. That is the only way we can progress and achieve our goal of being one of the world’s top centres for business, entertainment and leisure. Other scope of the project included 650m slip road connecting traffic outward the expressway to Omole/Olowora Junction, 700m Ogunnusi/Wakatiadura dual road from Kosoko road junction to the expressway, 250m PWC Road to the expressway, street lighting on all the roads and multi-bay bus parks, signalization of all junctions, pedestrian walkway and drainage infrastructure, among others."